In late October, 2012, Superstorm Sandy tore through the Caribbean before ravaging America’s heavily populated Eastern Seaboard. It was the second-costliest hurricane in U.S. history, but it might have been even worse had it not been for the American Red Cross and its use of social media. Through Facebook and Twitter, the Red Cross drove more than 400,000 people to download a hurricane preparedness app with vital safety information. And after the storm hit, the Red Cross monitored and analyzed millions of social media posts to pinpoint geographic areas in critical need, inform the government and dispatch local relief efforts. For anyone who still thinks social media is all about “socializing,” this is one story (out of many) that proves otherwise. Today, countless organizations are finding innovative ways to take advantage of social media’s pervasive presence and potential for immediate influence. Businesses use it as a tool to form closer connections with customers, offer targeted promotions, and build brand loyalty. Perhaps even more exciting, however, is how organizations like the Red Cross harness social media’s power to bring aid to people in need, and even save lives. Indeed, social media has moved well beyond friend requests and cat pictures. But to understand how it came this far, it helps to know the back story. For the Red Cross, it started in the early 2000s, when the organization was an early adopter of social strategies, using the web to connect with volunteers and benefactors. As Facebook, Twitter, Flickr and YouTube emerged, the Red Cross took advantage of those tools to raise awareness of their efforts year-round, and especially during disasters. A turning point came in 2010, when an earthquake devastated Haiti and the Red Cross launched a mobile giving campaign through Twitter. At its peak, the effort raised half a million dollars in one hour, and ultimately $32 million. In addition to social media’s incredible ability to mobilize benevolent giving, the Red Cross learned something else from the Haiti earthquake: thousands of people were using social media to communicate eye-witness accounts of disaster, and to ask for help. As the Red Cross scrambled to make sense of all the data and route it to units on the ground that could render aid, it became clear that they were on to something big. In the wake of the Haiti event, the Red Cross conducted extensive research on social media usage, and held a major summit to exchange ideas on integrating social media with disaster response. Before long, they realized that with more robust technology and infrastructure, they could proactively monitor and analyze the massive amounts of social data generated by natural disasters, and use it to coordinate its efforts – not just after, but before and during a crisis. 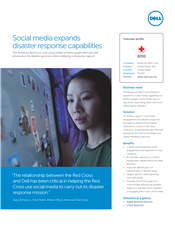 The Red Cross worked with Dell, another social media pioneer, to build a Digital Operations Center at its Washington, D.C. headquarters. Equipped with powerful computing capabilities and staffed by dedicated social engagement team members, the center “listens” for relevant public conversations happening in real-time throughout the social web. On an average day, the Red Cross is mentioned as much as 7,000 times in social media channels, and that number spikes dramatically when disaster strikes. People take to social media to express fear, seek help, or offer their support. Thanks to the Digital Operations Center, the Red Cross hears every one of them, and can act immediately to organize volunteers, deliver supplies, set up a shelter, or simply be a voice of comfort. That first center came online not long before Hurricane Sandy plowed into the East Coast, and it played a major role in preparedness, relief and recovery efforts. Since then, the Red Cross has opened two more Digital Operations Centers in Dallas and San Jose. Now, every time an earthquake, wildfire or tornado lights up the social media universe, the Red Cross is listening and responding faster and more effectively than ever before. And we’re all reminded of how technology, put to good use, can accomplish amazing things. Find out more about how Dell Services help prepare your business to be future ready, so you can address your customers’ needs in real time.